In Claire Denis White Material set in an unknown period in an unknown country we could believe that it is Cameroun in the midst of winning its independence with a long war that dragged out for 10 more years of civil strife. Rebel soldiers roam the lands of the French and steal their possessions. The French are leaving, and those remaining are unprotected. Marie Duval (Isabelle Hubert) insists on staying. She is oblivious to the dangers, and puts her family and her workers and servants at risk for refusing to leave. A local DJ gives news to the rebels in veiled language, and everywhere in the film , a transistor radio updates the ongoing strife. In general, the news of everything from marriage, to weather conditions is transmitted by radio. White Material is told in a smooth fragmented narrative style . Its chronology is inverted with the present at the apex of the film and frequent flashbacks to the days when the colonial presence was intact and secure. Among the secrets of this French colonial family is the affair that Marie has had with the corruptible town mayor. The Duval plantation is a source of employment, and later a target for pilfering the possessions of the French, called “white material” by child rebels, boys and girls, wielding machetes and spears. The leader of the rebels is “The Boxer”, played by Isaach De Bankolé, Their hero who has been wounded takes shelter in a shack on the Duval’s property. The French military have warned Duval to leave, and her husband (Christian Lambert) secretly sells the plantation to the town mayor. Meanwhile her rather unambitious and depressed son, André is attacked by the young rebels and in a style reminiscent of when Robert De Niro snaps in Taxi Driver, he proves himself of some value after all and follows the children’s army with a shaved head and a loaded gun with many rounds of ammunition. The secrets of this plantation family convince us that French knew what was going on in Africa but tried to maintain its lifestyle as a colonial exporter and remain in the country. Marie claims that Africa is all she really known, and complains that by returning to France she would be lost. President Thomas Sankara (21 December 1949 to 15 October 1987) was a young captain in the Burkina Faso army who was assassinated and who inspired the youth in Cameroon and neighboring African countries. The reactions to the white presence in this film resembles the insurrections in the Ivory Coast (home country of Issack de Bankolé) where whites were executed, raped and forced to flee the country during the civil war. The Boxer according to Denis is the memory of Sankara in the film, whose arm bears the tattoo “jamais k.o”. Denis’ long-standing cinematographer Agnès Godard couldn’t work on the film because her mother was ill. Godard said in an interview with Movie Magazine that although she wasn’t close to her mother she was glad that she remained in France for her final days. Yves Cape was selected instead who worked on Bruno Dumont’s films. (L’Humanité 1999, Flanders 2006, which both won the Grand Prix in Cannes). White Material was made with the absence of lighting since the equipment had been held up one month in customs after the team arrived. Cape was afraid that Denis was too used to working with Godard but that was ironed out as she reported to him that she wouldn’t be sitting watching his work on a monitor. 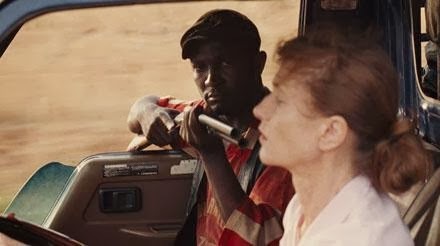 The script by Marie N’Diaye is followed but the final edit does not, which Huppert says is Denis’ way of working. Violence creates violence says Huppert which is the theme of the film.